Bardine's Country Smokehouse's promise to you is our commitment to producing the highest quality meat products at the fairest prices in the cleanest, friendliest environment possible while providing unsurpassed customer service. Bardine's Country Smokehouse adheres to the Meat Processors Code of Ethics. 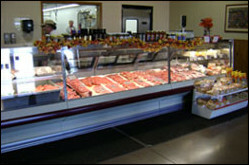 Member: American Association of Meat Processors and Pennsylvania association of Meat Processors. The following letter was submitted to the Pittsburgh Post Gazette by a Bardine’s Country Smokehouse customer. The letter was submitted in response to a request to find the best butcher in the reader area. In the little village of Crabtree, PA, hidden behind Rizzo’s Restaurant, is the best butcher shop in the USA. This butcher shop was built by an Italian who passed the business to his son. It is a little place where, not only can I tell Gary (Bardine), the owner, how thick I want my steaks, chops, bacon, etc. cut, but I can see him cutting the meat. I can buy one pork chop or a whole pig, one steak or a side of beef, cut the way I like it, packed the way I need it, ready for the freezer or the skillet. I can rent his equipment to roast a pig he has prepared, order enough hot sausage for a large crowd, or pick up some jerky for a snack. If I want it, he can get it. I may have to wait a few days but I know to call ahead. Did I mention he smokes his own hams? And that he has won awards for his kielbassi? Once you eat his meat, you won’t buy it anywhere else. Maybe it’s that old world Italian atmosphere, or the flashing knives, or the meat itself. Or that he asks about my family. But don’t tell too many people please. The line is out the door already.